In this article I'm going to explain how to load data on gridview control by using Jquery. In some cases to improve the performance of application we are loading data on demand basis, rather than load all the records at a time. Design div tag and place a gridview control inside that and set the div style property of overflow to auto. Since we are loading data on demand I prepare stored procedure with paging option, because we are loaded records based on index and page count. In the block of code based on PageIndex and PageSize as requested it's loading the records, but as per design we are fixing the height of the div tag is 150px; when the records height meets that range then scroll bar is enabled, whenever we scroll the header content will move to top, we can't able to see the header if we scroll down the records. To overcome this situation we can rearrange markup for fixed header like below. If we want to load database records (server side )using Jquery we have only one option i.e. using AJAX call, for that we require service method. For the above scenario I already create a service method in my project you can see in above c# coding block. Now, the next step is call the above (WebServices) webmethod using AJAX and append the records to gridview control. Use below code snippet for that. 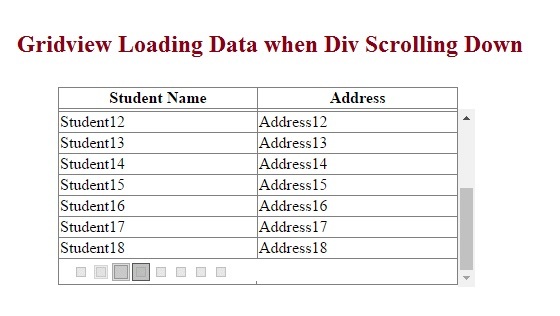 0 Komentar untuk "JSON : Gridview Loading Data when div scroll down by Using JQuery"